Ignoring Obama’s call for service, his supporters “hope” someone else will clean up their Inauguration mess. 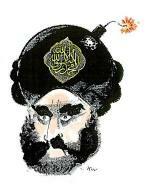 Some Change! For all you environmentally forward thinkers out there, don’t fret, as this year’s Presidential Inaugural Committee (PIC) is one step ahead. The Committee has teamed up with the EPA to make sure environmental impact is minimized wherever possible. From recycle bins that will line the National Mall to recycled carpet runners, the Committee has taken great measures to reduce the environmental footprint of the event. The inaugural event will likely leave a substantial carbon footprint due to the expected numbers in attendance, but efforts like these are decreasing that impact in valuable ways, and it’s a great way to start a new administration! 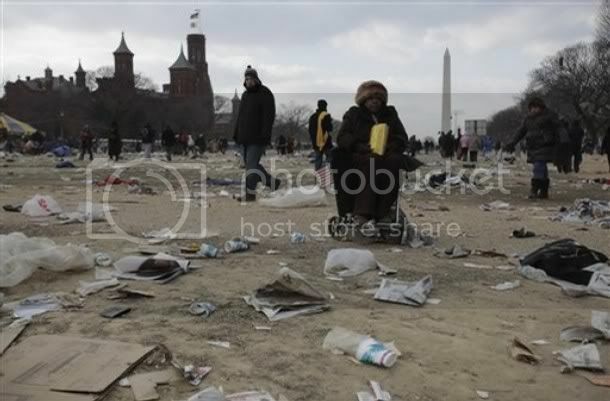 WASHINGTON: Inaugural revelers are lucky they didn’t get fined for littering. As crowds cleared the city today, their trash covered the National Mall and Washington Monument grounds after President Barack Obama’s inauguration. They left behind plastic bottles, newspapers, food wrappers, gloves and even American flags they had been waving. Yeah, great green start hunh? Just another example of “do as we say, not as we do” environmentalism.